From Hotel California to the Fugitive Motel, we've teamed up with Hotels.com to rate the Top 10 hotel songs. Got any to add? Hotels.com says: Arguably the most famous song about a hotel in the world, ever - and what many consider to be one of the greatest rock songs of all time - Hotel California was released in 1976 and is often described as a metaphor for America’s decline into materialism. We say: Don't forget to pack your air guitar. Hotels.com says: The Chelsea Hotel in New York City was Cohen’s home away from home. The song is about an evening he spent with fellow musician Janis Joplin. He later regretted admitting the song was about Joplin, due to the nature of the lyrics. We say: Cohen's is one of many tracks recorded about this legendary hotel. Remember Joni Mitchell's Chelsea Morning? It also gave us Jon Bon Jovi's Midnight in Chelsea, however. Hotels.com says: Heartbreak Hotel was the King’s first US No.1 pop single and the most successful song of 1956. Written by Mae Boren Axton and Tommy Durden, the lyrics are based on a newspaper article about a lonely man who jumped from a hotel window. 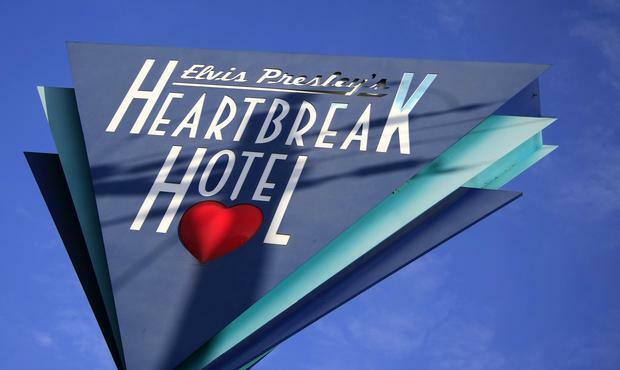 We say: Did you know there's an actual Heartbreak Hotel in Memphis? No, really. "The fashionable boutique hotel takes its cues from the legendary hospitality and personal style associated with Elvis Presley," it says. Hotels.com says: Memory Motel features on the Rolling Stones’ 1976 album Black and Blue. The ballad is significant as it features both Mick Jagger and Keith Richards sharing lead vocals. It is widely speculated that the ‘Hannah baby’ referred to in the song is Carly Simon. We say: A significant track, but not a spectacular one. 3-star! Hotels.com says: Hotel Yorba was recorded in Room 206 of the former Hotel Yorba, built in 1926 in southwest Detroit, which is now used as government-subsidised housing. It is rumoured that the duo have since been banned from the building. We say: A tub-thumping classic with lyrics that definitely check out (sorry). Hotels.com says: Sung in Hebrew, this catchy pop tune by Fool’s Gold was released in 2009. The video depicts a ‘typical day’ for the Los Angeles collective and shows the musicians enjoying a fun day in the sun. We say: A new one on us. “I blow you a kiss, it should reach you tomorrow..."
Hotels.com says: English band Elbow sing about the loneliness of being in a hotel room on the other side of the world missing a loved one. The track was released in 2003 from the album ‘Cast of Thousands’. We say: Loneliness isn't such an issue now that we've got Netflix. Hotels.com: Considered to be the song that popularised Hip Hop in the United States and across the world, Rapper’s Delight is the 1979 hit from The Sugarhill Gang. The shout-out to hotels and motels has been quoted in many Hip Hop songs since. Hotels.com says: Blue Hotel is a song from American musician Chris Isaak, who is most famous for his 1989 song Wicked Game. We say: Did you know Isaak is also an actor, with roles in Twin Peaks: Fire walk with me, Friends and Silence of the Lambs? Hotels.com says: There’s a Small Hotel was composed by Richard Rodgers in 1936, with lyrics by Lorenz Hart, and recorded by Ella Fitzgerald in 1949. The biography of Lorenz Hart claims the song is about the Stockton Inn in New Jersey, although another claimant says it was written about the Montecito Inn in Santa Barbara, California.